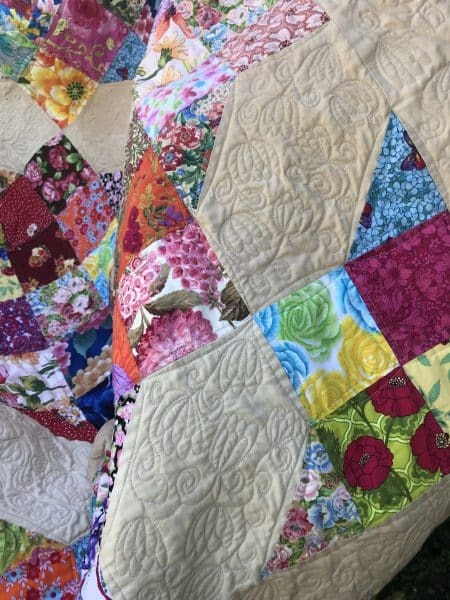 Antique Pink, Country Roses Four Patch Quilt Pattern, Fabric and Pre Cuts for Quilting, Floral Fantasy Friendship Finale, Quilts and Quilting, Signature Pre-Cuts from Your Stash, Wash Your Pre-Cuts? Some time back, my FB friend Jill, was kind enough to send me a lovely sampling selection of fabrics from her stash. As we both love florals, I couldn’t think of anything nicer than combining our fabrics to make a quilt, which I named Floral Fantasy Friendship Four Patch Quilt. I prewashed the fabrics. If you use pre-cuts, this might be of interest. As you know I love scrappy. It’s always interesting how fabrics come to life when they are mixed with other fabrics. It’s the sum of their many beauties which complement each other. It’s like making a beautiful garden with your fabrics. I went about cutting fabrics from my stash. Click on the link to view the fabrics. You may remember some of these. One of the techniques I used for this quilt was hand dying the background fabric. I like the dreamy, uneven muted colour of it. Plainer background fabrics make a nice canvas for free motion quilting. This is how I used Avocado to make the Antique Pink fabric. Once I had come up with the design, I decided to make this quilt entirely by treadle. I did all the piecing on this Singer 66. This is how the quilt turned out. 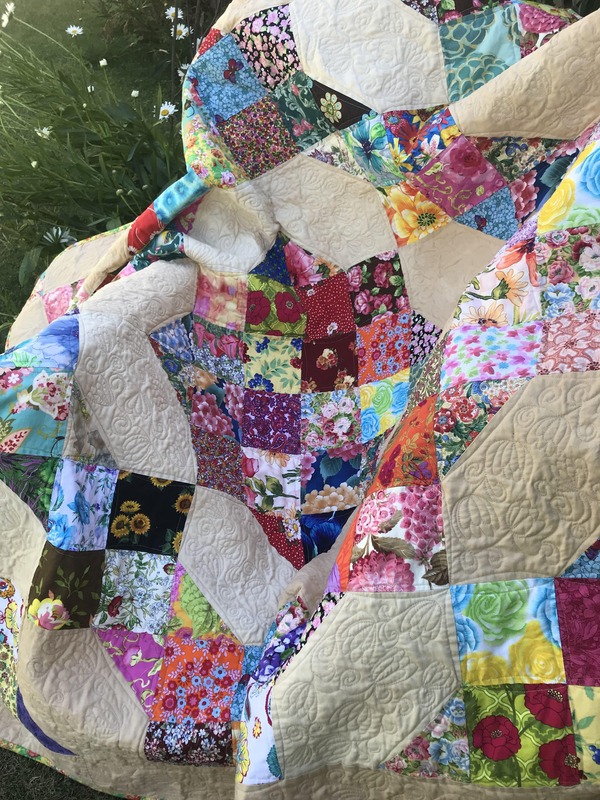 All the Quilting was done by treadle, using my Singer 31k 20 to free motion quilt it. I quilted Tulips into the background areas. Click on the link Treadling Tulips to learn that technique. 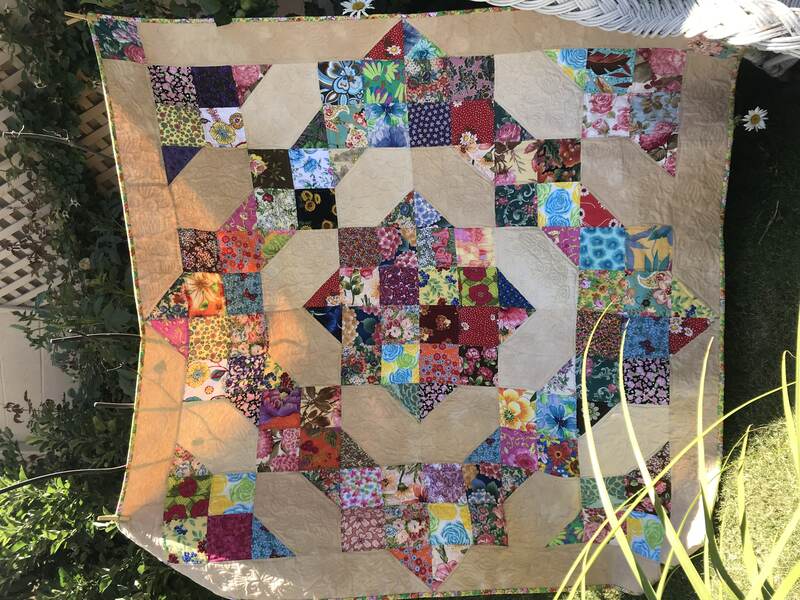 I used a Sashiko style curved Quilting around the floral blocks. Maybe you would like to share some fabric squares with your friends to make a quilt like this? 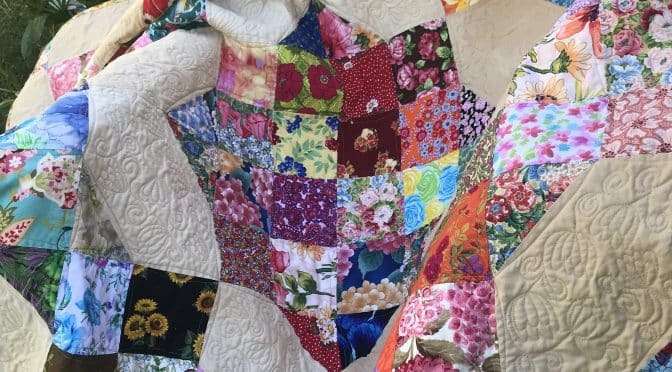 You can access all the details for piecing this Floral Fantasy Friendship Quilt here. If you enjoyed this quilt project you may also like this quilt pattern of Country Roses Four Patch.